It is unusual to find this edition complete, and very unusual to find it in such good condition. A very collectible set. Characteristics: This is a complete reprint of Baum's Classic series. All 14 of his books are reproduced. The series is known as the White Edition because of the white borders. They differ from the early 1900's first editions of the work in this way. All books have illustrated endpapers and are illustrated by the original illustrator (for 13 of the books it's John R. Neill, the first Wizard book was illustrated by W.W. Denslow). 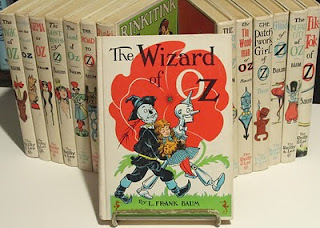 There are additional titles in the Oz series, but none of them were done by Baum.